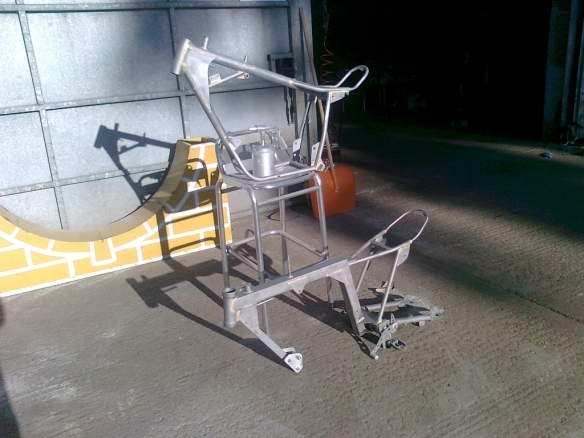 Painting your BSA Otter Frame could be better than Powder-coating. Well you know when you have supposedly finished building your bike up and you think every thing is in the right place, then you jump onto the bike, and find that this, and that, is not quite to your liking . Exhaust run, wrong. Need a bracket for that, and another to reposition the ignition coil as it hits the tank, and the tank could do with moving up a 1”, I could keep on. 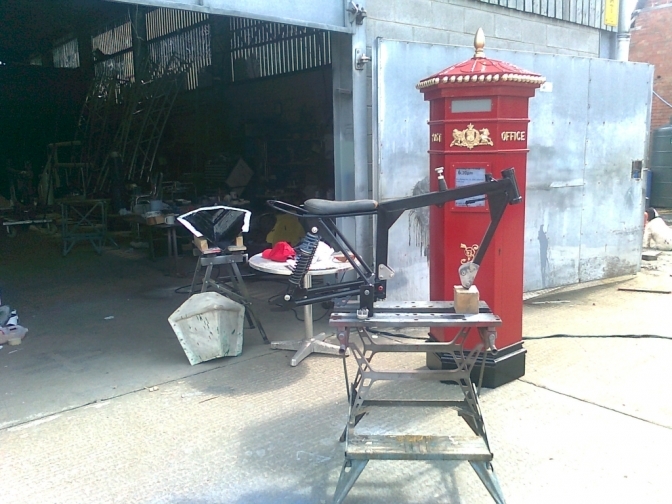 Now your precious powder coated frame is not going to look the same with welding torch scorch marks on is it? So you spend ages, and I do mean ages, looking for ways you can hold this and that onto the frame, without damaging the powder coat finish. I have come to the conclusion, that there are two alternatives. You either build the bike up without any paint on the bike at all and ride it until you are satisfied every thing is right. 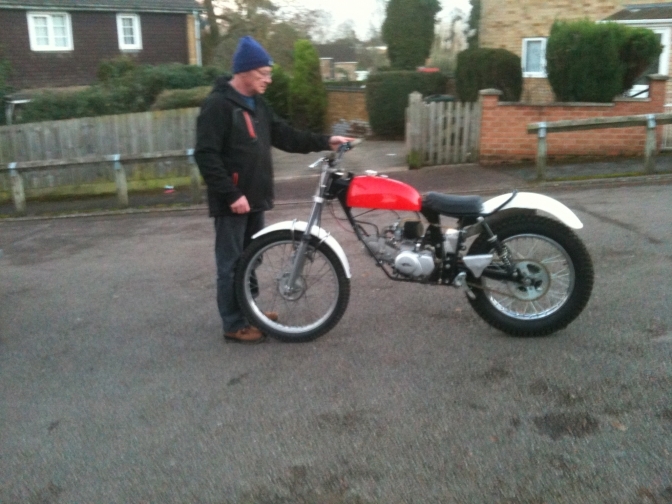 Dave Wood is doing this with his bike. 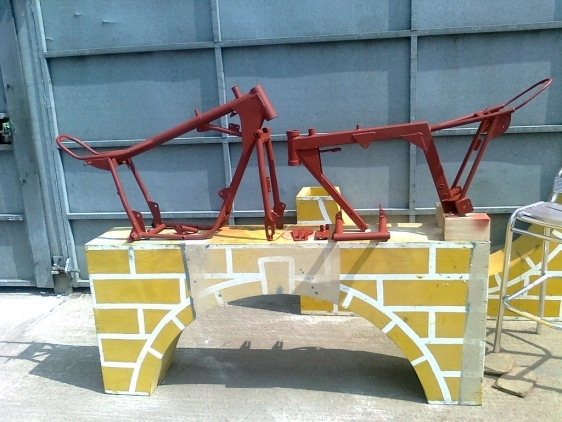 Or you sand blast and paint the frame when you think you have every thing in the right place, and if there is need later for modifications, it is not too difficult to remove a small portion of paint to weld on a bracket, and then make the paint good again. So what paint do I use? Well after a short investigation to what is available. I have come to the swift conclusion, to use an epoxy based fast black paint. There are a couple or three on the market. So you makes yer choice. I will probably go for the one marketed by PJ1 Fast Black frame paint. Here is a tip from PJ Harvey himself. And it looks like there is no need to use an undercoat, unless you want to. I will attempt to do a frame this next week with pictures and we will see how the job turns out. Firstly I will sand blast the frame using only standard "play pen" type silica sand , with a cheap spray gun type gun appliance, but you will need a good respirator type mask, and a compressor that can keep up the 100 plus pounds constant pressure. Now most of my frames and the ones from Faber , are bronze welded, these frames need extra care when blasting ,to make sure you remove all traces of borax type welding flux from the joints . 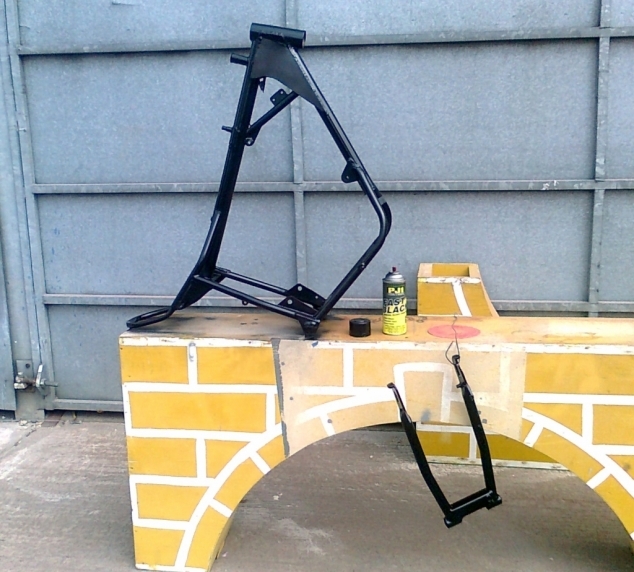 Here below are the pictures of the three stages of painting a frame. 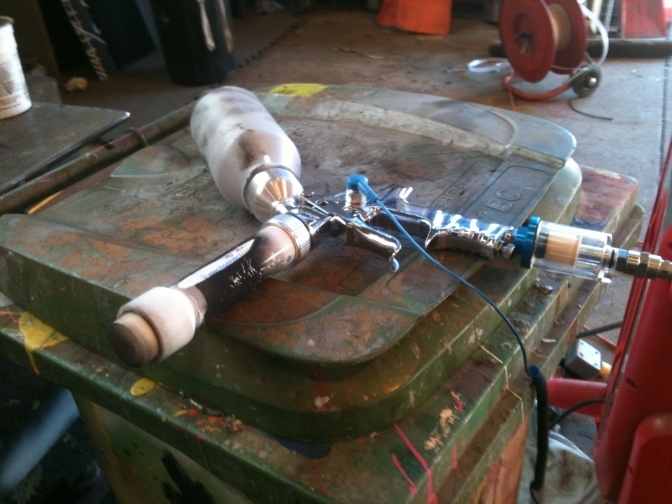 Shows the frame's sand blasted with the gun in the picture. the abrasive element was only silica sand (dry). I might add during all days of painting the frames the temperature out side was about 75F so more like a oven temperature. Shows the frames sprayed with a good grade of red oxide primer, mixed with cellulose thinners. 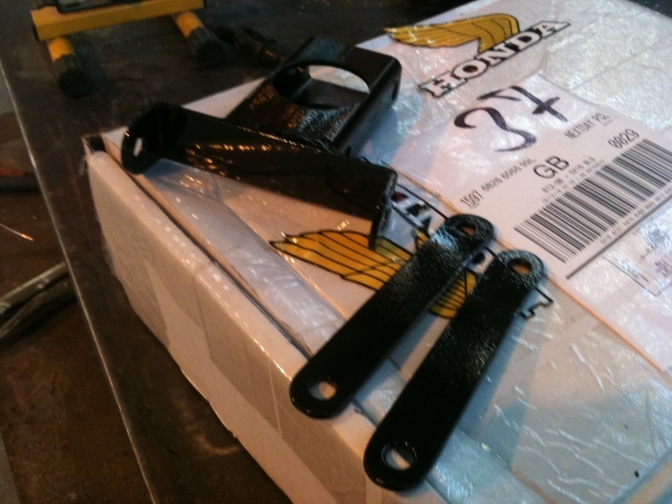 Shows the John Husband frame painted with the PJ1 epoxy black paint. this was sprayed in the middle of the day when the sun was hottest, and to be quite honest, it baked the paint on, and was dry by five thirty. We will see how good a finish it really is, and what it stands up to, but it looks good at the moment. 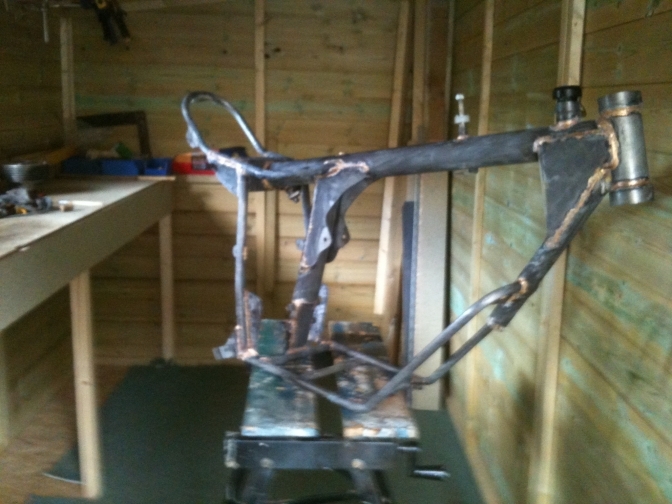 The SQ frame is going to be finished with a different paint and then 2K lacquer, picture later. One thing you always need to check is that there is no moisture left in the steel tubing . So leaving these frames in the mid day sun more than helped the situation. Now with a good coat of chromate red oxide primer the steel should be sealed from the elements and be ready for the top coat. I remember my CoTTon "Telstar" frame all those years back 1965 had this treatment and stayed on the frame event after event and being in several "OFF'S". The "Hubbo" frame above had several coats of the PJ1 fast Black paint, in fact there was only just enough paint in the can to do the job. After another twelve months on the bench after the frame was painted, the paint seems to have stood up very well to getting moved about with occasional knocks. It is not one of the best finishes on a frame I have seen , but is quite up to the job. Most of the bolt on parts are going to be plated with our new plating kit. I will run a page for this for you when we do it. The Square tubed frame was sprayed as suggested above, and then given a coat of two-pack clear lacquer on top of the paint. it seems OK but did go slightly dull. OK I have decided to use a well thought of paint system for the Super Cub Trials frame to try something new and see if all the praise about the product system is true. You know me by now, I have got to try every thing once. The New Paint system being used is the American POR15. I have it on order and will start the process in a couple of days. 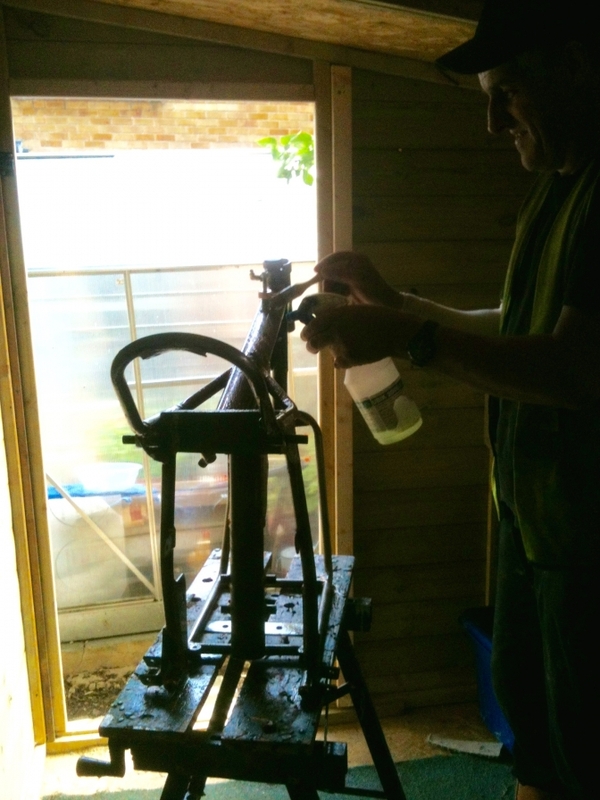 Firstly you clean the frame and then use the POR15 Cleaner degreaser. There is a specific time to leave this on the frame before removing it. with water! Then the Metal Prep is applied, and the same again leave and then rinse. Now coats of POR15 Black Rust Preventive is applied. Before finally coating with the Top Coat below. I will go into more detail about the more technical side of this product as we use it. Solubility: POR-15 is readily soluble in esters. ketone's, and aromatic solvents. 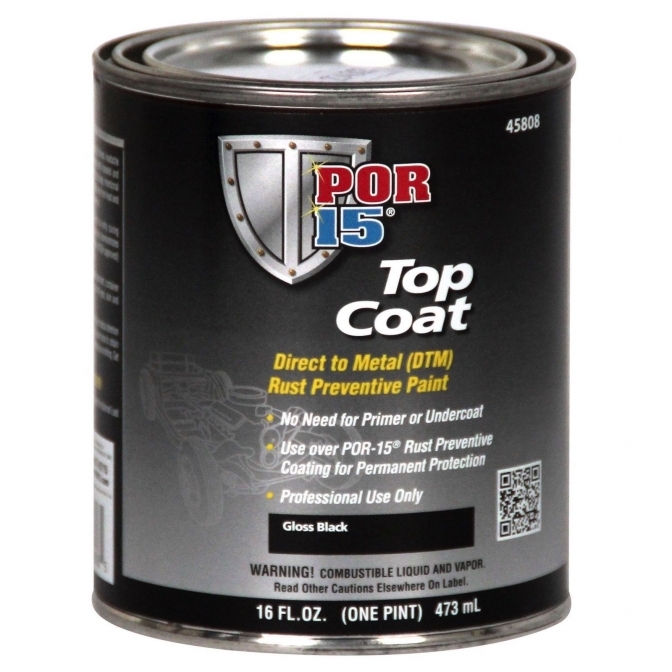 Moisture will shorten the life of unused POR-15. See our 'Residual Moisture - Little known Facts' page to learn some little-known facts about residual moisture. Video of work done with this product. 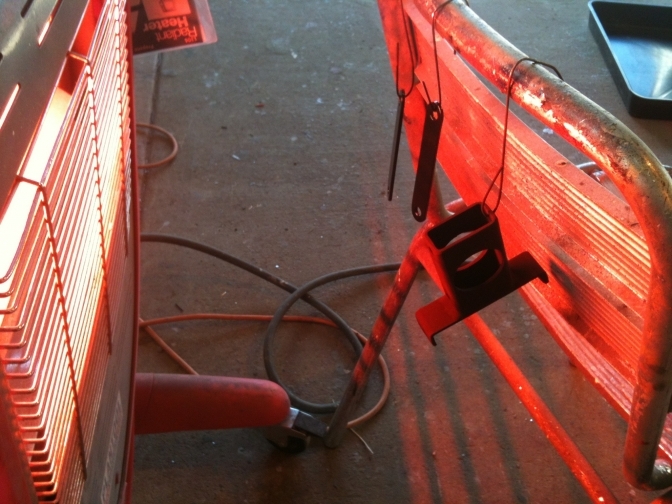 Then coated with the metal prep to the instructions on the can. 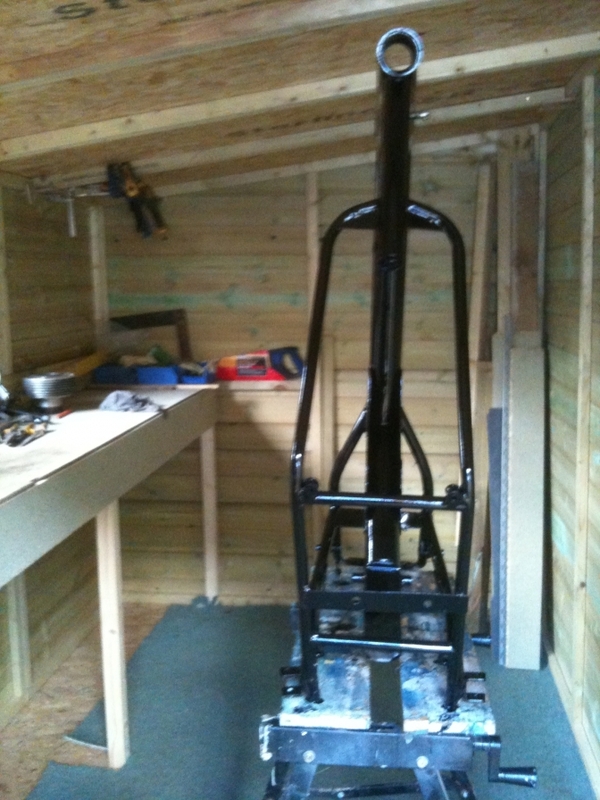 Then coated with the POR coat, and finally the POR "Top Coat" this one in Matt Black. And job done . a good hardy finish to the frame. More later on other paint finishes. I have decided to investigate the possibility of doing some powder-coating at home. the powder-coaters we always use at Redditch..
and thought I will just have to paint the bits again. (yes I know it has taken a long time). There will be an awful lot of parts to paint. So it would be far better if we could powder-coat them. 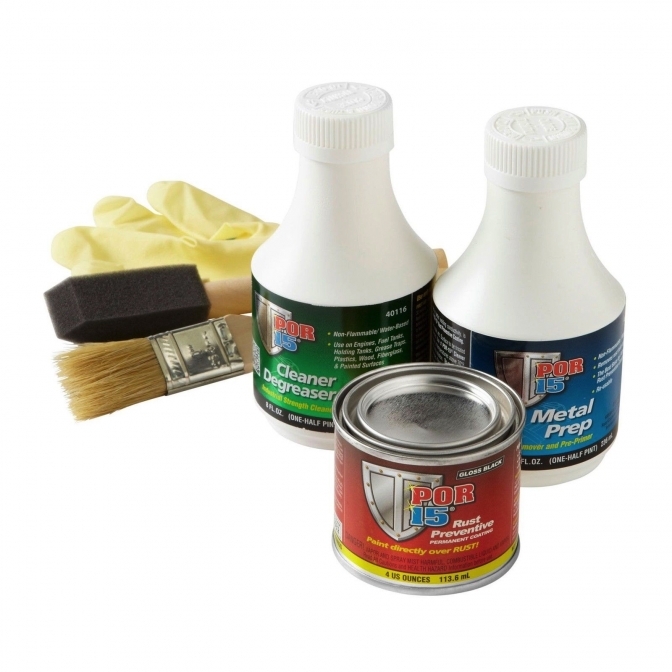 Easy Coat Powder Coating System from electrostaticmagic on Vimeo. old electric oven is the way to go? So More when I have plans for that. And one by one the parts had the added attraction of the heat from the gun.